This year’s scare season has hit New York—are you ready for a frighteningly good time? Throughout the state you’ll find no shortage of haunted houses, farms, fields, mazes, and other experiences that will haunt your dreams for weeks to come. Will you be brave enough to see them all the way through, or will you head to your nearest exit and never return? The line between fantasy and reality blurs at these 10 best haunted attractions in New York—enter if you dare. This long-running haunted attraction will send shivers down your spine. Featuring the biggest corn maze in the area, a farm run on pure evil, and a spine-chilling cemetery, this haunted homestead might seem impossible to escape. Will you be one of the lucky ones that can make it back to civilization? This Guinness Record-holding scream kingdom has garnered national attention for good reason: they know how to push the boundaries between what’s real and what your brain wants to believe. Six attractions feature Hollywood-quality effects that make you feel like you’ve landed in a horror movie. Just prepare to be looking over your shoulder long after you’ve left the park—this one will stick with you well after you leave. This haunted scream park features three terrifying attractions in a single location: Zombie Tag, the Barn of Terror, and Flashlight Woods. Each experience is just as chilling as the last, giving you plenty of reason to scream. Ever imagined what your last ride on earth will feel like? Ride in an authentic hearse complete with open casket seats and experience a ride unlike any other. A haunted hayride and terror-filled house complete the experience for a night that will make you glad to see the light of day. Probably the largest attraction in all of New York, 11 total attractions create an epic Halloween experience that’s made as the same stuff of your worst nightmares. Come face to face with beasts, ghouls, killers, slashers, and demons straight from hell. If you think you won’t walk away feeling an ever-lasting tingle down your spine, think again. Four whole floors of screams and shrieks await unsuspecting visitors to this epic haunted mansion. Some say it’s truly haunted, so good luck figuring out what’s real and what isn’t. They also have an escape room this year—choose one or the other, or get a deal on both! There isn’t much that’s more terrifying than a group of blood-thirsty hillbillies. In fact, some might say the acting and effects look a bit too real—but you’ll have to find out for yourself what’s real and what’s just for fun. Leave the kids at home for this one. You won’t a freakshow circus like this at any family-friendly carnival, nor will the Motel 666 be on just any abandoned highway. 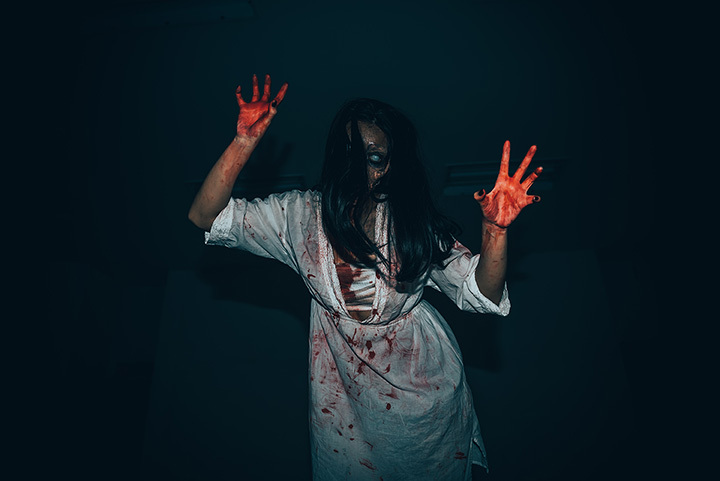 The five haunted attractions here are among the most gruesome, frightening, unexplainable scenes your eyes will ever see. You can see all the horrific adventures with a combo price or explore only the ones you’re brave enough for with a la carte prices. A five-minute tractor ride doesn’t seem like something that will make you tremble, but rest assured this will be the longest, most heart-racing five minutes you’ll experience this Halloween season. Live scary creatures await along the path, and you might just be their next victim. Don’t be too excited to disembark the tractor though—it’s taking you straight to the haunted maze and barn that you’ll have to escape before you’re allowed to leave! The winner of multiple awards and lots of recognition, this haunted attraction is truly unlike any other in the state. Set on a 250-year old farm of over 65 acres of terror, this fully immersive experience will send you straight to your darkest fears. A one-mile hayride, corn maze, and seven haunted attractions give you no shortage of thrills to enjoy this Halloween.